A collection of beautiful tumbled stones produced using Ohio Flint mined from the Flint Ridge deposit. 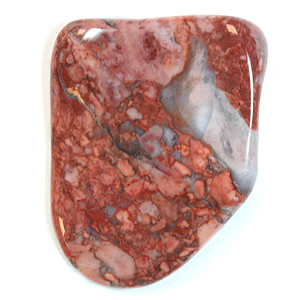 These stones range from about 3/4 inch to three inches in maximum dimension. You can see the great variety of colors and patterns that occur in this flint. Ohio flint is a tough rock. The rough flint was tumbled for three to eight weeks in coarse grit in a rotary tumbler. Then they were processed through medium grit, fine grit and aluminum oxide polish (two days each) in a vibratory tumbler. Brightly colored pieces of Ohio Flint rough from Flint Ridge before tumbling. We really like the striking red, white and gray colors! Most of the material that we have seen is nice solid flint with an occasional druzy cavity. One of the first rocks of value in the area that we now call "Ohio" was flint. As early as 12,000 years ago, the Native Americans of Ohio recognized flint as a hard, tough, durable rock that could be chipped or flaked into sharp tools and weapons. These people traveled long distances to collect the flint. One locality was especially important. That was a ridge in eastern Ohio where the Vanport Flint is exposed in outcrop. The area is now known as "Flint Ridge." There, Native Americans dug hundreds of shallow quarries along the crest of the ridge to produce flint. This "Ohio Flint" is easily recognized, and today pieces of it are found in archaeological sites across eastern North America. It is found in those sites as tools and weapons as far south as the Gulf of Mexico and as far west as the Rocky Mountains. In the early 1800s people started cutting large pieces of Ohio Flint into buhrstones. Buhrstones are large cylindrical wheels, up to several feet across, which are used in a mill to grind grain. Smaller hand-powered grinding wheels were also produced from the flint. A small amount of Ohio Flint was used as "flints" in flintlock rifles and pistols; however, the flint did not have the proper characteristics needed to work superbly in this use. Small amounts of flint were also ground to a powder and used as an ingredient in glazes for ceramics and glassware. A few people still use Ohio Flint to carry on the tradition of "flint knapping" - the art of making stone tools and weapons by hand. 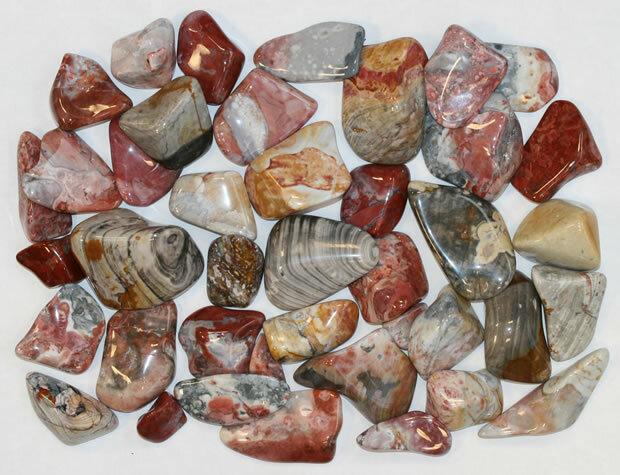 Tumbled stones produced from Ohio Flint with great color and an exceptionally bright luster. The requirements that a material must meet to be considered a "gemstone" are durability and beauty. Pieces of the Vanport Flint easily meet these requirements. It can be extremely colorful. It is very hard (Mohs hardness of 7). It is very tough, meaning that it does not break easily. It can also be polished to a brilliant luster. In 1965 the Ohio General Assembly passed a bill that made Ohio Flint the state's official gemstone. 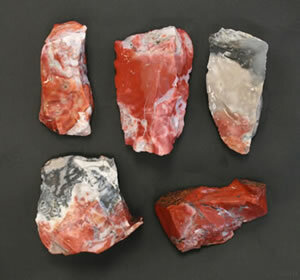 Ohio Flint is cut into cabochons, beads and other ornamental objects. 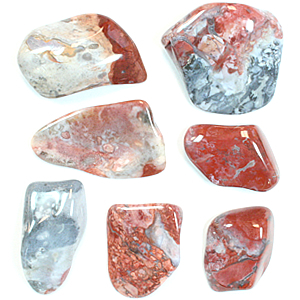 Many people also use it to produce tumbled gemstones. We recently tumbled some Ohio Flint and share our tumbling method below. Agate, jasper and flint (often called "chert") are all supposed to have a hardness of 7 on the Mohs Scale. However, anyone who has tumbled these materials or used them to produce cabochons knows that some varieties are much harder than others. The Ohio Flint that we tumbled was extremely hard. We knew from the start that extra time in the coarse grind would be needed to round the material nicely. 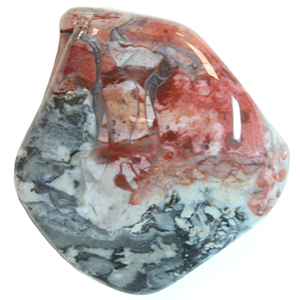 We also knew that a couple extra days in the polish might make a big difference in the luster of our tumbled stones. A photo showing a few pieces of our flint in rough condition appears at the top of the right-hand column. This tumbled stone allows you to clearly see the brecciated nature of the flint. The fracture zones between the colored flint fragments are often filled with clear quartz. We began by sorting through our rough and breaking or discarding pieces that would not tumble into nice shapes or had voids that would trap grit. We then loaded about three pounds of flint pieces into a rotary tumbler barrel with enough large ceramic cylinders to bring the tumbler barrel up to operating capacity. Because this flint was very hard we knew that a seven-day tumble would not be nearly enough time for shaping. So we added twelve tablespoons of coarse grit (a seven-day charge would be eight tablespoons) and marked our tumbling log for a three-week tumble. At the end of three weeks we emptied the barrel and cleaned the flint. All of the sharp edges had been removed and most pieces of flint had been reasonably rounded. More brecciated flint in a wide range of colors. This is the gray-cream-red range so common in the Flint Ridge material. The three-week tumble in coarse grit was done in a rotary rock tumbler with the hope of "rounding" the flint. Rotary tumblers are best at "rounding" stones. We then switched to a single barrel Lot-O-Tumbler, a vibratory tumbler that can process rock much faster than a rotary tumbler. We loaded the rock and ceramic pellets into the Lot-O-Tumbler barrel, adding a few more large ceramic pellets to make up for the volume lost during the three-week coarse grit tumble. Then we added two tablespoons of medium grit and ran the Lot-O-Tumbler for two days, stopping twice a day to rinse the rock and add fresh grit. After two days in medium grit we cleaned the barrel, rock and pellets and ran the rocks in fine grit for two days, checking a couple times per day but not rinsing or adding fresh grit. At the end of two days we cleaned the barrel, rocks and ceramics. At this point the flint was exhibiting a slight luster and was ready for the polishing step. We then loaded the rocks and pellets into our polishing barrel (we use a separate barrel for polishing to reduce the possibility of grit contamination). We then added two tablespoons of TXP aluminum oxide polish and started the tumbler. Normally we polish for two days in TXP and get great results. However, since the Ohio Flint was a very durable material, we decided to tumble it for four days. We checked the tumbler twice a day, removing a few stones to check on the progress. At the end of two days they had a nice luster but the luster made a visible improvement on each of the following days. At the end of four days the flint had one of the highest lusters that we have produced - so we stopped the tumbler and cleaned up the rocks. A few polished stones from our efforts are shown in the photos at right. Check them out!